The Melrose Apartments, situated in the vibrant neighborhood of Melrose, TN, is a great place to live. The apartments are part of a converted 1940’s cinema complex with multiple floor plans and onsite amenities to make this a perfect place to call home. Starting with upgraded flooring, stainless-steel appliances, granite counter tops and hardwood floors, the A2 unit is a 1-bedroom dream. Walk-in closets, solid wood cabinetry, washer/ dryer hook-ups and garden tubs finish off this apartment with modern luxuries. Our flexible pet policy ensures that you and your furry friend have a beautiful place to home in Nashville, TN. Nashville is one of America’s best cities to live in, and the Melrose Apartments makes it shine. We strive to have something for everyone on site. We boast a salt water pool, bike racks, a 24-hour fitness center with a dedicated fitness concierge for those with an active lifestyle. As this is Nashville, the Melrose has a dedicated music performance venue and movie screening lounge for the use of our residence. Partner that with outdoor grills, lit courtyards, and clubroom with a demonstration kitchen makes entertaining friends and family easy. When living at the Melrose, you have a flexible pet policy, amenities, and modern conveniences all designed to create a community. Our vibe and local attractions have you at the doorstep of several great music venues and dining establishments. Siema, Fenwick’s 300 and The Sutler Saloon are in the complex, and our proximity to the 440 Parkway and I-85 has the best that Nashville has to offer just a short drive away. We are close to Vanderbilt University, making the A2 unit a perfect choice for students and faculty alike. Your new beautiful new home is waiting for you at the Melrose. 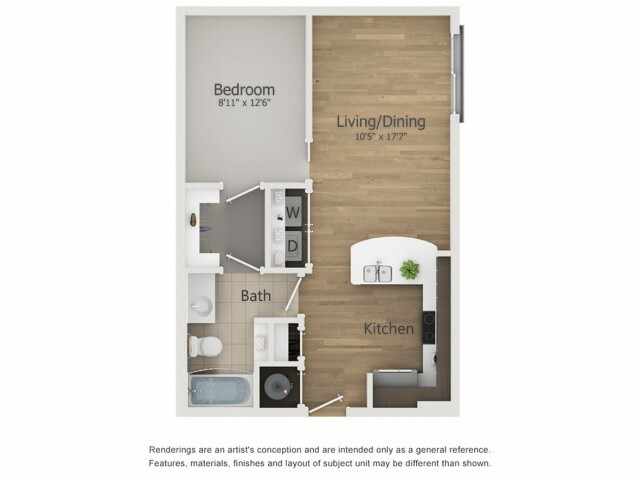 Call (615) 696-7448 now to tour the A2 one-bedroom apartment, or simply click here to apply.